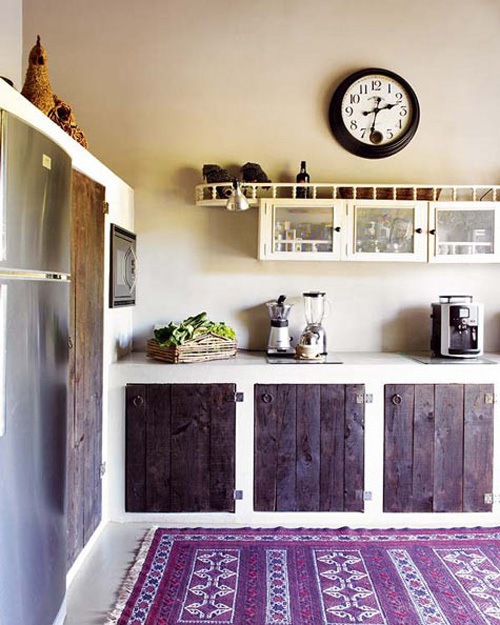 Today I’m loving … this rustic kitchen with a colorful rug. I love this kitchen today and everyday! Thanks for sharing. I am loving this rustic kitchen. What great inspiration. I am working on a design board for my future kitchen and this is definitely going on it. Gorgeous! The use of colours is amazing! Gorgeous. That isn’t technically a rug–it’s a kilim, a “rah-rah.” Means “road road,” since the weave looks like roads. We have several from our time in Turkey–it’s my personal favorite type of kilim. Handmade kilims are fabulous for the kitchen because they are flat woven, can be easily maintained and easily cleaned, and wear beautifully. They are very durable and bonus–much cheaper than handmade pile rugs!